Since its release, Bethesda’s casual post-apocalyptic mobile title has been making waves all over the world for its unique and addicting gameplay. Fallout Shelter lets you oversee a vault, where survivors seek shelter; manage resources and fend off intruders to make sure everybody’s safe inside. You will assign tasks to deserving citizens and ensuring they live happily in an underground bunker. 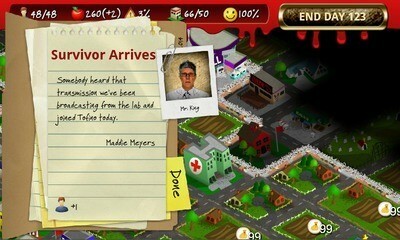 But things get tougher as you expand your vault to accommodate more survivors. The game tests your survival skills and provides a report card at the end of the day to show how well you did to make survivors happy. Doomsday Preppers is the closest thing to a FS-like game you can find on Google Play. Based on the popular Nat Geo show of the same name, the simulation game lets you build a bunker underground, complete with different types of floors like Workshop, food and Water, recreation and security. You can go deep underground by building 100+ floors and improve your survival skills through micromanagement and proper planning. The game lets you play the role of a “prepper”, educates you about survival and prepares you for the crises in the near future. There’s also a wonderful tutorial explaining the ins and outs of the game. Doomsday Preppers building mechanics and design is very similar to Fallout Shelter. After creating multiple floors, you can send survivors to each floor, assign them tasks and monitor progress. The tasks include making “prepping materials”. Creating materials takes time, so you will need some patience before you complete them. Thankfully, you can close the game and let it notify you about each floor’s progress. The visuals are very nice, cartoonish, bright and adorable. A must-down game if you are looking for something similar to Bethesda’s Blockbuster sim game. 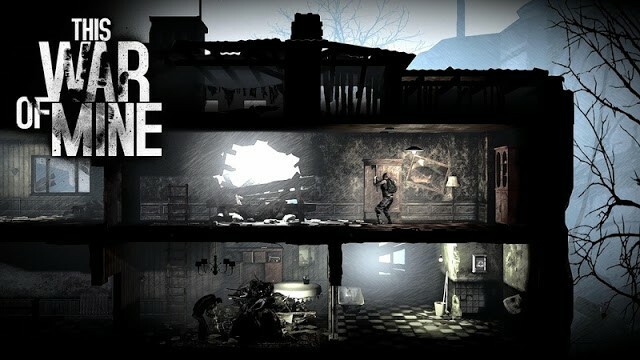 This War of Mine (TWoF) has everything you would want to see in a Fallout Shelter-like game. While the latter presents a bleak post-apocalyptic setting with cartoonish visuals, TWoF has beautiful, almost realistic graphics that will definitely appeal to gamers of all ages. Like Fallout, This War of Mine allows you to manage a shelter, but in a war-torned world. You will control survivors, make sure they get food and water by crafting unwanted materials into useful items and protect them from looters. This War of Mine’s see thru rooms of a dilapidated building are very reminiscent of floors in Fallout Shelter. However, gameplay is far deeper, challenging and complex. Like Shelter, you will need to send a survivor on a mission to scavenge dangerous areas for items. However, the scavenging phase will allow you to control your character. You will stealthily move in No-go areas to search for key items, avoid direct confrontation with strangers, soldiers and looters and even fight them for survival. While you will spend most of your time managing shelter, overseeing rooms and protecting survivors from incoming threats, there will be a time when you will need to take harsh decisions and may have to sacrifice dear ones to ensure others survive a bit longer. This is where TWoF does exceptionally well in emulating real-life hardships faced by survivors. This War of Mine provides a new randomly generated world and characters every time you play a new game. The cel-shaded graphics are stunning to say the least. Forget Shelter for a minute, download and play this unforgettable game. Rebuild is an excellent “build and survive” game with a post-apocalyptic setting. After a zombie outbreak, you and a bunch of survivors are stranded in a city surrounded by the infected. As the leader of your team, your goal is to make sure zombies don’t infiltrate your outpost while looking for food and supplies for fellow survivors. To expand your territory and find items, you can send some of your survivors to explore the wasteland. Once you have expanded your territory, things become more challenging. You will need to recruit more survivors to protect your territory and also make sure they do not die of hunger by finding or growing food. Managing resources and manpower become quite complex as you expand your outpost. Rebuild has several endings, and your moral decisions, proper planning and tactics will unlock good endings. A score is also determined by the decisions you make and a report will show your progress, did you win or lose, the number of endings you unlocked and how much time you took to survive the land of the undead. The game throws plenty of challenges that will keep you hooked for hours. If you want a game like FS with a post-apocalyptic setting, then Rebuild should be a good choice. Though its gameplay mechanics is very different from Shelter, the post-apocalyptic setting and survival elements share some similarity with it. If you liked Fallout Shelter’s micromanagement and building style/design, then you should play Tiny Death Star. You can build floors, just like FS, but there are no survival elements in this game. It’s a Star Wars-themed game with the objective of building and expanding a Death Star. To do this, you will be inviting “Bitizens” and assign them virtual businesses to let the profits rolling. The proceeds will then be used to build a better, bigger Death Star – as big as the size of the moon. 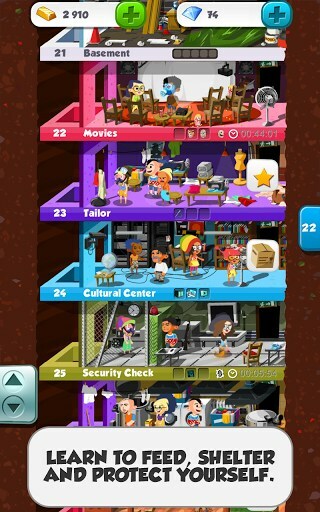 There are different types of levels or floors including “residential levels” where bitizens stay; and retail, food and service levels, where they will be assigned special tasks. Assigning bitizens to their matching businesses will earn you more “Imperial Bux” and rewards. Those who are not fit for any job can be shown the door to free up space for the deserving ones. There are also special missions where you can protect the emperor’s superstation from invaders and catch rebel spies to foil their plan of destroying it. Tiny Death Star has adorable pixel art graphics. There are several familiar characters as Bitizens and plenty of fun missions to complete. Managing a superstation was never this much fun! Unfortunately, the game has been removed from the Play Store, but you may find the apk if you search online. 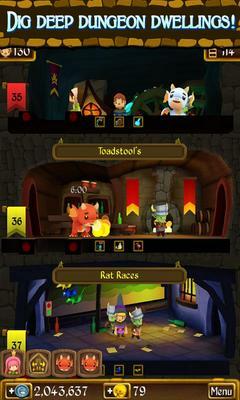 Another game with building mechanics similar to FS, Lil’ Kingdom gives dungeon crawling a whole new meaning. Like FS, you will dig underground, but instead of floors, you will be building dungeon dwellings to keep knights, goblins, even dragons! Build a dragon hatchery to produce baby fire-breathing creatures. These adorable baby dragons will roam around dungeon dwellings, creating a very cute and cheerful scene. There are other special creatures to fill dwellings, provided you build a matching dungeon for them. It’s a magical world, far away from the bleak dark setting and it’s extremely fun building your dream kingdom underground. There are several missions assigned by the princess and completing them will grant special items. Fill your collection with special items and you will unlock a special dwelling. Overall, Lil’ Kingdom is a fun title and while it may not be too similar to FS’s plot, concept or gameplay-wise, it does share some elements with it. There are also a few good games like Fallout Shelter for iPhone and iPad users. These include iOS space games like Pixel Starships and Star Trek Trexels, where you build the enterprise complete with different types of “See thru” floors. Check out our list to know more about them.